Have you ever had a favorite candle with wick problems? It burns funny and the wick gets buried in wax and it will no longer burn? Or you’ve reached the bottom of the candle, the wick is gone, but there’s still a lot of wonderfully scented wax left? Or, do you go through a lot of tealights and feel bad about the waste they create? Before you throw away those misfit candles, save your empty/used tea light containers, and keep reading! You can reuse all of them! New empty tea light tins, if you don’t have old, used ones. This is great if you have a lot of wax left. I did this with a candle that stopped working shortly after I bought it. There was about 3/4 of the wax left but the wick was shot. Step 1. Preheat the oven to 180º and place the candle you wish to re-purpose upside down in a glass bowl. Pop it in the oven for a few minutes (5-10) and shortly after, the wax will melt on the sides of the jar and will separate from the glass. If you have a jar with straight sides, it will plop right out and you can take the old candle jar out of the oven and skip to step 2. If you have a jar with curved sides, you will have to leave it in the oven until all the wax melts out. This will take anywhere from 10-30 minutes depending on the kind of wax and how much you have. I set a timer for every 10 minutes and kept checking. Step 2. While you’re waiting for the wax to melt, set up your candle. If you are reusing the original jar, clean it out with paper towel. If there are remaining bits of wax in the jar, you can stick it in the freezer and they will chip right out. Once your jar is cleaned, stick your wick in the bottom making sure it’s centered. Step 3. Once the wax is completely melted, take it out of the oven and slowly pour it into your jar and let sit until completely hardened. If you are using a standard wick, you will want to make sure it stays centered from the bottom of the jar all the way to the top. You can do this by laying a clothes pin over the top and sticking the wick through the hole in the middle. If the jar opening is too big, just lay two knives across the top to support the wick. Note: Let candles cool completely before lighting them. It’s best to wait 24 hours. With this method, you can remove the wax from the jar and put it into used (or new) tealight containers. Step 2. Set up your tea light tins. Lay down some wax paper or a double layer of paper towel and line them up. Stick the wick in the middle. If you purchased wicks that are too long, trim them down to be about a half inch taller than the tin. Hello, I am Stephanie Baker, creator of Gather - A Festive DIY Studio in Harbor Springs, Michigan. Gather is a fun place to get together with friends and create something with your hands! I focus on offering fresh, fun designs that are exciting to create and stand the test of time. We make indigo dyed fabrics, recycled wood cutting boards, hand-knit winter hats, and woven wall hangings, to name a just few of the classes. We even explore the culinary world a bit with cheese making, kombucha, and sourdough bread classes. My purpose for Gather is to create a warm, welcoming environment where people of all ages and lifestyles come to learn a new craft or specialty. Every issue of Homelife, I will be contributing a new project for you try out! You can go to gatherharborsprings.com/homelife to find step by step instructions on how to complete each project, or you can come to Gather in Harbor Springs and take the class! I don’t know about you, but I have noticed a growing trend where we all tend to overcommit, live too fast, and neglect ourselves and our friendships. Think about it, when was the last time you spent a really rewarding evening with your pals that didn’t have a purpose like celebrating someone’s birthday or a baby shower or attending a Christmas party? I recently stumbled upon a TED talk about just this, and it completely resonated with me and my purpose for Gather. It talks about how important it is to turn get-togethers into consistent gatherings so we can build the kinds of relationships that fulfill and sustain us. 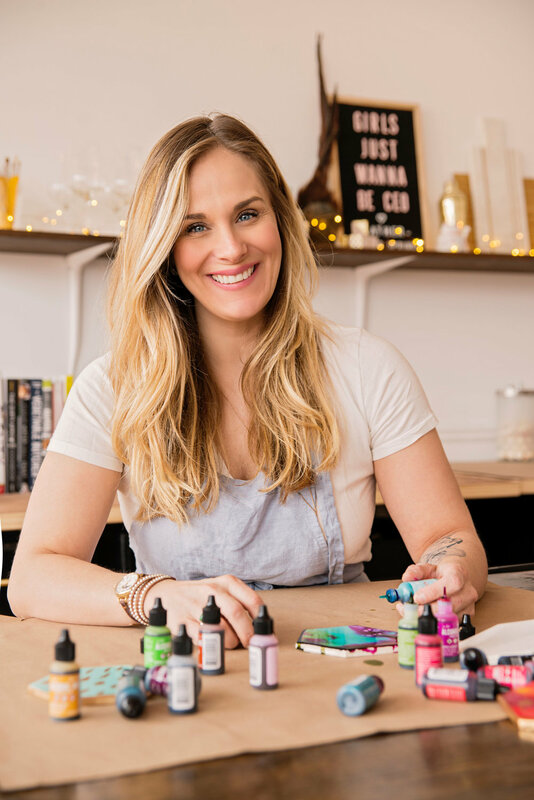 When I am feeling stressed out and overcommitted, the first thing to go is a planned get-together or that crafty class I signed up for with my girlfriends. But in many ways, it is probably the very thing that would fill me up the most and keep me going! I brought this topic up with my girlfriends, sent them the video, and we immediately set a weekly date to get together at Gather. We decided that the best way to keep up our weekly gathering was make them have a worthwhile purpose. We planned a weekly “Maker’s Night” as a way to connect with each other and also create something new for ourselves or to give as a gift. And true to the name, we also drink whiskey. This last week we got together and created this modern take on a woven wall hanging. Making something with your own two hands is therapeutic and reduces stress, it grounds you and gets you to focus on something other than your next errand, what you’re making for dinner, or your to-do list. You focus on the present, which is the art you are creating and the company surrounding you. And you are actually getting something done because you are making new napkins for your home, a piece of art for your walls, or a gift for a friend. So come to the Gather studio in beautiful Harbor Springs and take a class or two! You can find a listing of all current classes here. More classes are being added every day! If you’re interested in that video, here you go!